In all the years I have been filming birds in the Pennines I have been disturbed on many occasions but what happened in June this year was quite unique. I had been sat in my hide in a peaceful Oak wood, deep in the Pennines, filming a pair of Green Woodpeckers as they fed their young (see blog 8th July). It was a delightful place to be with the Woodpeckers appearing every hour and providing me with plenty of good photos. Suddenly the Woodpeckers gave alarm calls and drifting through the wood was the sound of a marching band! If that was not bad enough the same notes were repeated incessantly for the next two hours! Eventually I had had enough and I walked out of the wood to the edge of the moor to see what was going on. 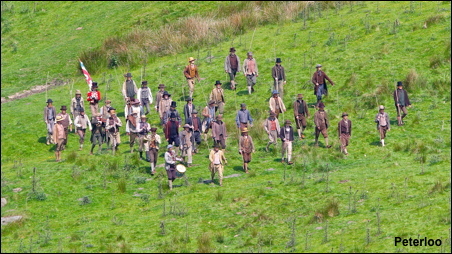 There in front of me was a scene from nearly two hundred years ago as close on fifty people marched up the valley complete with a vast production team and drones overhead. They were filming next years blockbuster film on the Manchester Peterloo massacre of nearly two hundred years ago. So when you sit and watch this film next year and the marching scene is shown spare a thought for the frustrated photographer sat in the Oak wood nearby and not knowing what was going on!